It’s a minefield. Finding the best tipsters who are going to make you big profits can be a long and painful task. Who can you trust? How can you avoid being ripped off? Where do you even start? What you really need is someone whose advice you can trust. Someone who will try out the thousands of tipsters for you, to identify the few that really stand out and which will provide you with fantastic betting profits. And then you need that person to continue monitoring the performance of the chosen few, checking that their results aren’t a fluke so that you avoid losing money in wasted fees and lost stakes. Most of all, you need that person to be completely independent and have no interest in “pushing” tipsters who, in actual fact, might not be much good. The Smart Betting Club has no affiliations, is 100% independent, and monitors hundreds of tipsters every year. And in our Tipster Profit Reports, published every quarter, you can see just which tipsters are performing, and which continue to perform. 1. The racing tipster who has been in ridiculously good form. If you had started following this service 12 months ago with just a £2,000 bank, you would have made a clear profit of £6,835…AFTER subs fees!!! This tipster has combined his experience as a professional gambler with his IT background to develop a computer model that identifies value in the racing markets with unerring accuracy. This service turns over your betting bank quickly generating huge bank growth. 2. The football tipster who has hot 119% ROI over the first two months of the season. Smart Betting Club Hall of Fame inclusion is the ultimate accolade for any tipster. It means they consistently make a very strong profit for their members, over a prolonged period of time. This service has been a Hall of Fame member since 2013. An all-time ROI of 8.5% over almost 3,000 bets covering five seasons is why. 3. A FREE racing tipster with 146.5% betting bank growth since the start of 2014! This service epitomises how and why it is possible to make fantastic betting returns on a strict budget. You don’t need to pay out expensive fees to tipsters to make money, as this service highlights…22.1% ROI for 2015 to date! Where else can you make such an investment with no up front costs?!? 4. A top-performing South American football expert averaging over £4,000 profit per year. There’s a lot to be said for a tipster who identifies a niche market to exploit for profit. Quite simply, this chap has made it his business to know more about South American football than the bookies, and the results speak for themselves. With short losing runs, high turnover, and amazing betting bank growth, you can make huge profits from this tipster’s specialist expertise. 5. The UK & Irish racing guru who is on fire with a 76.4% ROI from 101 bets covering just the last two months alone! Hitting big-priced winners with amazing frequency, this tipster is setting the standard for form readers the world over. And this is no flash in the pan, as bank growth of 258% over the last 12 months testifies. > The Best ‘Hall of Fame’ Tipsters: Discover who the 20+ top tipsters are that we independently recommend to our members. All of whom have proven records of making a long-term profit. > Detailed Ratings On Every Tipster: Each of the 57 tipsters we track has its own designated Key Facts Page with 10 different ratings covering everything from cost to customer service and profitability. The Smart Betting Club is the only 100% independent tipster source! Yes, that’s right, as whilst all other review sites use affiliate links or make money referring sales to the tipsters, all SBC tipster reviews and ratings are 100% independent and affiliate-free! From novice to pro – beat bookmaker restrictions and develop your betting in five easy steps! What’s that statistic about 99% of all gamblers being losing gamblers? It’s no wonder that the bookmakers spend so much money on advertising their company on television. They’re desperate for more and more mug punters who will ‘do’ their cash betting on accas, scorecasts or via their FOBT machines. But what if you’re one of the 1% who isn’t a mug punter, and you start to make some real money from your betting? And what if you follow some of the expert tipsters we have reviewed and shown to be massively profitable over the long term? What then? Are the bookmakers so accommodating to you when you’re taking a consistent and reliable income from them? No, they’re not! Far from it in fact as sadly it’s all too well known these days that some bookmakers restrict and close winning accounts. These bookies are not stupid. Winning punters are bad for business if you are a bookmaker, especially when you consider the very easy money they make from FOBT machines or their online casino. So how useful would it be to have the help and insight of people who have grown their betting from scratch into something that produces a considerable income? So what happens when the big bookies identify you as a threat and single you out for their special treatment? You see the bookmaker is controlling their liabilities. They’ll let you win £20 or £30 perhaps, but no more. And the trouble is, once this process starts, you’re on the sure and steady path that ultimately leads to an email from the bookie saying they are no longer letting you place any bets. They’ll tell you it’s a trader’s decision, and that’s it. Nothing by way of further explanation. Is this annoying? Yes, very! Does it mean the end of your betting and profits? Absolutely not! It IS still possible to make a good second income, or even primary income, from following good, proven tipsters. In the special Bookie Guide we released last year, we ran a series of in depth articles aimed at helping members avoid bookmaker restrictions for as long as possible (more on that later). We also provided a guide to the five stages of developing a betting portfolio in such a way that you need not worry about bookmaker restrictions when they do eventually strike. Step 1: Starting out – new accounts free of restrictions; a time for high ROI following top racing services. Step 2: Diversification – laying the foundations for future growth by introducing football and sports betting. Step 3: Shifting the focus – as restrictions begin to bite, more concentration on sports betting allows bigger stakes and more income. Step 4: ROI for show, ROC for dough – how your ROI will fall, but your bottom line profits will grow. Step 5: Scalable markets – identify where your stakes can get bigger and bigger as your turnover expands. Diversification is everything when it comes to investing, and that’s what our betting is, right? An investment. And as with any investment, it’s vital you don’t put all your eggs into one basket. The trick is to identify which series of baskets to put your eggs into so that you can continue to make money not just in the here and now, but for a long time to come. Be A Mug…And Reap The Benefits! One message that came through from our research is that if you can convince your bookmakers that you are indeed one of the 99% of mug punters, then they will leave you alone. So how do you come across as being a mug punter? Well, our article highlighted eight different ways you can make yourself look like you don’t know what you’re doing, whilst at the same time making money. First impressions – don’t go wading in immediately with big, shrewd bets. Start slowly and build. Play the casino every now and again – don’t spend a lot in there, just pay the odd visit. Place some ‘mug’ bets – and then lay them off on the Exchanges. There are many more hints and tips that your betting will benefit from, including how to harness the latest technology such as Virtual Private Networks to help you stay under the bookie’s radar(there’s actually two full reports into exactly how to do this and which VPN is the best – including an update from September this year). And by doing these things, believe me, your accounts will stay open and unrestricted for far longer than you might have thought possible…and that means raking in more cash from your betting. Plus several fantastic bonus systems & guides to help your betting. What’s more, you’ll be able to make excellent profits from today and continue doing so tomorrow, next week, next month, next year…. The very latest Smart Betting Club Tipster Profit Report has just been published, featuring the latest results, ratings and rankings for 55 of the best tipsters we have uncovered in 9 1/2 years of independent analysis. 1. The racing tipster in ridiculous form. In the last 12 months alone, from a £2000 starting point you would have made £6835 profit AFTER subs fees! 2. The profitable football tipster off to a flyer already this season with 119% ROI from the first 2 months! 3. The free racing tipster with 146.5% betting bank growth since the start of 2014! 4. The top performing South American football tipster averaging over £4000 profit per year. PLUS Many, many more top-performing tipsters we simply don’t have the room to write about here! > Detailed Ratings On Every Tipster: Each of the 55 tipsters we track has its own designated Key Facts Page with 10 different ratings on everything from cost to customer service and profitability. Can you hit 100% ROI in one month? Cash in with a superb free trial to a proven and hugely profitable horse racing service…available only to new SBC members…! Wouldn’t it be nice to find out exactly who the tipsters are that get the bookies running scared? Can you imagine how good it feels to wait for a simple email each day from your chosen experts, place your bets, and then watch your accounts grow as the profits rack up? And wouldn’t it be even better if you were able to do all this without spending a penny in tipster fees, because you were able to grab a free trial until the end of the year!?! Well, what greater launch-pad into the world of making excellent profits from horse racing could there be, than a free trial to an up and coming superstar of the tipping world? In 2014, James Boyle hit an astonishing 51% ROI. A starting bank of just £2,000 would have grown to £3,566 in just 12 months. In 2015 to date, James Boyle is continuing to rattle up the profits for his members, hitting a fantastic ROI of 20.3%. A three month membership to James Boyle Racing usually costs £130 and due to popularity is now closed to new members anyway, but by signing up to join the SBC today, you can profit from this superb service until the end of the year without paying a penny. Previous Trial = Roi Of 106%!! To highlight just how powerful these free trials are, we need only look back to June, when to celebrate the release of our latest betting magazine we ran a similar offer. Those who signed up had an unforgettable month of betting, as James piled on the profits. When everything had been counted up at the end of the month, James had released 46 bets, and made a startling 49 points profit at an incredible ROI of 106%! This means that even if betting to just £5/point, triallists cleared £245 in that month alone. Anyone who signs up for either a Smart Betting Club Gold or Platinum membership by Midnight on Monday 19th October will enjoy this free trial to James Boyle Racing until the end of the year. This represents an immediate saving of £130. There is no small print or hidden costs to worry about – simply sign up today for your SBC membership (Gold or Platinum) and we will kick start your trial to James Boyle Racing immediately. The Fink Tank is the name given to the football ratings developed by a company called Decision Technology (Dectech), which we have utilised at the SBC for several seasons to identify value football bets. We have run the system for several years, over which time it has made a strong profit. In June of this year, Dectech announced that they would no longer be publishing their ratings for free, meaning that the SBC is the only body able to provide the Fink Tank System bets. The Fink Tank System has enjoyed a tremendously profitable start to the 2015/16 season, and hit FOUR OUT OF FOUR WINNING BETS LAST SATURDAY! A membership to the Fink Tank System usually costs £215. But by signing up to a Gold or Platinum SBC membership before Midnight, Monday 19th October, you will enter a draw to win a full season’s Fink Tank membership. Read more about the Fink Tank Service. Everything we do is focused on helping you make as much money betting as possible, so if you’ve yet to take the plunge, why not sign up before midnight this Monday 19th October and see how we can help you. Can you really try out the best tipsters for free? You can make great money from your betting by following tipsters. You simply pay for their expertise, follow the instructions, and the profits will flow. After all, if you want your sink unblocking, you’d call a plumber. Or you’d try a mechanic if there’s something wrong with your car and you don’t know where to start putting it right. Well, if you want to make money from gambling, is there a better or easier way than hiring the services of an expert tipster? The problem is, there are a lot of bad plumbers, mechanics, and tipsters out there, and they’re all after your money. How do you know you’re not about to be stung when you take on one of these people? How do you know you won’t waste money hiring a bad tipster who will lose you even more cash when you follow their bets? Wouldn’t it be fantastic to put a tipster on trial for free or at a greatly reduced fee before taking the plunge? That way, you could test him out to make sure his style suits you. Then, and only then, you could pay him the subs fees, and with much greater peace of mind. An SBC membership opens up all sorts of possibilities when it comes to securing free trials and discount offers. You can check out the best tipsters in the market with minimal risk. Let’s look at a typical example. Top football betting service Winabobatoo has been proofing to us here at the SBC for ten years (and no disreputable service ever lasts that long!). On Wednesday we announced an extra special deal where SBC members can subscribe to the Winabobatoo service for just £2 for 2 months. Winabobatoo uses a statistical model to identify value in the UK 1×2 football markets, and members can use the ratings in many ways. It is so simple to follow one or more of the many proven systems Winabobatoo has generated, or you can use the ratings can be used to develop your own systems. Either way, Winabobatoo has proven itself by producing consistent profits. Take the ‘Plus 5 Value’ system for example, which has got this season off to a flier, with 9 points profit so far at an ROI of 20%! Or Winabob’s own ‘Thirty Point Plan’, already 8.5 points towards it’s season’s target of 30 after Month 1. There are many ways to follow Winabobatoo. It is a simple task to find an approach that suits your personality and betting style. You can read much more about the various systems and methods that you can use in our own in-depth and independent review. And don’t forget, you can try this service out for yourself for 2 months for just £2 as an SBC member via the Tipster Discounts & Trials we offer. Winabobatoo is one of the heavyweight football ratings systems we use to put together our famously profitable Combo Football Betting System bets. In short, we found that betting the teams identified by two or more of the best football ratings services will massively boost your profits. You can read more about our very popular Combo Football Betting System in the 2015/16 Essential Football Betting Compendium supplied to all SBC members. It’s always great to be able to pass on special offers and discounts to our members, and we can put the icing on the top of the cake when we can also raise money for a very worthy cause. It is no secret that last year, Mike Lindley, the brains behind the Winabobatoo service was diagnosed with cancer. Happily he was treated successfully and has made a full recovery. Now, he’s on a mission to raise as much money as he can for Cancer Research. For every person that signs up to the special £2 for 2 months Winabob offer via the SBC, Mike will donate the £2, and the SBC will match the donation. Mike also hopes that people will make a voluntary donation from the profits made during their 2 month trial. So far, nearly £5,000 has been raised by Winabob members. This offer will benefit everyone – it gives you access to a proven, profitable football betting service, and more and more money will be raised for a great cause. You can read more about Mike’s story and his aims via his ‘Just Giving’ page. Special Offers And Discounts Galore! The Winabob special offer is just one of many that SBC members enjoy. Sports betting service with 98% bank growth in the past 12 months – free trial until the end of October. Racing guru running at an all-time ROI of 37.5% from early 2014 – 60 day free trial. Long-term Hall of Fame racing service Northern Monkey with 11.7% ROI from 4,000 proofed bets – 2 week free trial. Long-term football betting service specialising in top European leagues – 60 day free trial. You can read more about these and many other discounts, free trials and priority subscriptions to the very best tipsters in the market here. All of these offers, and many more, are exclusive to SBC members. Remember when we said it would be lovely to be able to try out tipsters before taking the plunge? Well, by signing up to the SBC you will be able to both save money and trial tipsters proven to be the very best, making sure they’re right for you, and with very little or no upfront costs. And in the case of Winabobatoo, you’ll be donating to a great cause to boot! It might be an International Football break but there will be no shortage of interest in the Premier League over the next fortnight, thanks to the new managerial vacancies at both Sunderland and Liverpool. …And for the shrewd gambler, this means only one thing. Potential winnings to be made in the extremely volatile Next Football Manager markets at both clubs. So to help you with this, I have put together an updated 6 point guide to help steer you in the right direction for betting on next manager markets. New manager markets are renowned for seeing false gambles whereby a sudden move for an outsider can see a rush of money in no time at all. Sometimes these are based on nothing more than a bookmaker slashing the odds on a manager (for no real reason) to kick-start a false gamble. When David Moyes confirmed he was leaving Everton, in the first 2 weeks after he announced his departure, over £630,000 was traded in the next manager market for the role at Goodison on Betfair. It was safe to say that nobody had a clue about the next appointment and numerous candidates during this period all traded at very short prices. A simple policy of laying everyone under this marker 4.0 (3/1) would of reaped major dividends in this market. All of the candidates above also traded at much bigger prices so there is plenty of opportunity to trade them out at a later date to lock in profit too. The eventual winner, Roberto Martinez traded at the lowest price during this period but even with the loss on him, you still would have collected on 7 of the others under 3/1. 3) Always, always check Betfair! Betfair without question always has much better odds than many of the more traditional bookmakers and you should always check their odds first before placing a bet. The differences can be vast too as the current next Sunderland manager market is proving. At the time of writing, some bookies such as Bet Victor are offering puny odds of 11/10 (2.1) on the favourite Sam Allardyce, who is available as big as 2.90 on Betfair. In fact the best bookie price across the board on Big Sam is 6/4, so there is greater value by using the exchange here compared to the best bookmaker. This is often replicated across numerous candidates in almost all next manager markets. Always, always check Betfair first! The very best manager markets are those where a decision on who the next boss is might take some time to become apparent (up to a couple of months). This allows the opportunity for plenty of different favourites to appear, with rumours and counter-rumours ensuring an ever-changing market, which is ideal for trading. Of course it’s impossible to know for certain, exactly when a manager market will be a drawn out affair, but it helps to read between the lines. The board at Man Utd knew exactly when they would be replacing their manager but some hot-head chairman who fire their manager on a whim, often don’t have a clue where to start. These are the markets that can be lucrative. It can also pay to not believe everything that managers say when it comes to these markets. After all it was only 3 days before he announced his retirement that Fergie wrote in his programme notes how much he was looking forward to the future managing Man Utd! A classic example of this came back in 2005 when Harry Redknapp controversially switched from Southampton to arch-rivals Portsmouth and stung countless punters on Betfair. So much so that Betfair even discussed their concern over the amount of money backing him, a point backed up by the Saints chairman who stated his belief it was outside the rules of the game and required investigation. Many managers also use the fact they are linked with these markets as negotiating tactics to get better contracts or to apply pressure on their current board to get what they want. How often do you see an up and coming manager refuse to rule out leaving to a club with a vacancy, only to then sign a ‘new improved’ contract to stay put a few days later? Too often! 6) Be Careful On Markets Where The Manager Hasn’t Gone Yet! Finally, I would always advise being very cautious if betting in markets where the current manager is still in situ. After all it when the Next Man Utd manager was settled, some people had been waiting over a decade for their bet to come in! This can also apply to those managers who are in danger of getting the sack. It doesn’t always transpire that they will be fired and if they do stay in a job, you could be left with a bet going nowhere and on a candidate who in a few weeks time may no longer be suitable. The likes of Martin O’Neill (2.0), Pepe Guardiola (2.6), Carlos Queiroz (3.1), Sven Goran-Eriksson (4.0), Roy Keane (4.0) all traded at extremely short prices for the Man Utd job during the 11 years the market was active. You wouldn’t have fancied your chances with any of these when Fergie said he was leaving! Mind you, with the average tenure of a Premier League manager now less than a year, this may become less of a problem! If betting to make money on football interests you then we also have a whole host of tipster reviews, free systems, advice and strategies to help as a Smart Betting Club member. Starting with our 2015/16 ‘Essential Football Betting Compendium’ – An exclusive package featuring everything you need to know about the best tipsters, systems and strategies to maximise your football betting this season. Sign-up here to gain instant access to your copy now. Some people think that tipping odds on doesn’t work, but we’ve found a tipster that shows that it does. How often do we hear that you can’t make a profit betting short priced favourites? We’re told that backing odds-on shots is a mug’s game, that it’s a quick way to go broke. But if there’s one thing we’ve come to realise after years of analysing and independently reviewing hundreds of betting services, it’s this: never make assumptions about how you can make money from betting. You see, it’s all about finding value. And for you and me, it’s about finding those talented tipsters who have proven their ability to do just that…whatever end of the market they operate in. Walk into any bookmakers on a Saturday morning and you’ll find punters filling in their football coupons. Thousands of accas, many made up of the afternoon’s “certs” – Chelsea, City, United, Celtic. All of them very short prices. Trouble is, it always seems there’s one cert that lets the bet down. After all, you can’t make a profit backing short priced favourites! At first glance, an ROI of 2.7% across all the bets this tipster has advised is nothing to get overly excited about. But if we scratch beneath the surface, which is something we’re very big on doing in our reviews, the figures can be viewed in a completely different light. Look at the strike rate. With 81.7% of bets winning – that’s more than four out of every five – we can recommend a betting bank that is much smaller than that advocated for many other services. In the case of this tipster, if using level stakes we suggest using a bank of just 15 points. Now let’s look at the table again. You have made 16.4 points profit. That means you have more than doubled your betting bank in just 12 months! And that’s backing at average odds of just over 1/4! But Can’t Anyone Pick 1/4 Winners? Why Pay For These Tips? Well of course you can try. And if you can consistently average more than four winners out of every five bets you place at odds of 1/4, then give us a ring. A career as a tipster awaits! The reality of course, is that it’s actually far from easy, even at such short odds. In fact, it is incredibly difficult. It’s human nature to think we’re better at doing something than we actually are. We all tend to think of ourselves as crack drivers, but we all occasionally forget to indicate! And so it is with tipping. The successful bettor will know his own strengths and weaknesses. He will appreciate how hard it is to achieve 100% betting bank growth in a year. He will be wise enough to respect someone who has proven he can do it, rather than think it’s easy and lose money trying to do it for himself (remember those Saturday afternoon losing accumulators!). There’s no shame in following a tipster, even if they are betting “certs”. Not if they’re producing the goods, which this guy is. Bookmakers love these bets – they’ll not be closing your account. It’s much easier to get on at 1/4 than it is at 4/1, never mind 14/1! Opens up new avenues for you if your bookie accounts are already restricted. Potential to use bigger stakes to make a bigger profit. High strike rate equals great betting bank growth opportunities, plus the chance to utilise different staking strategies for high risk/high reward returns. In our SBC 94 review, we found too that it is remarkably easy to boost your profits further. Our in-depth analysis uncovered the fact that this is a service settling results to odds under what are effectively achievable simply by shopping around. Our conclusion was that you could easily get an extra 2% on top of advised odds, which would increase the current 2.7% ROI to 4.7%, with significant improvements to your bank growth and actual take home profit. An ROI of 4.7% would mean a 28.7 point profit, a Return On Capital of 191.4%! I hope we’ve finally put to bed the notion that you can’t make profits from betting at very short prices. In fact, not only that but I hope we’ve explained how the savvy punter can benefit hugely from following a tipster such as the one featured above. As a punter, you need to know your strengths and weaknesses, and to acknowledge when someone is more skilled than you are at what they do to make a profit. The beauty though, is that you can take advantage of their expertise to enjoy great returns. To make money from this tipster today, all you need do is sign up to the SBC now to gain immediate access to a free trial available exclusively to SBC members. This trial will run until 1st November, plenty of time to try the service out for yourself. By signing up, lengthy losing runs, difficult to place bets and restricted stakes will become a thing of the past. 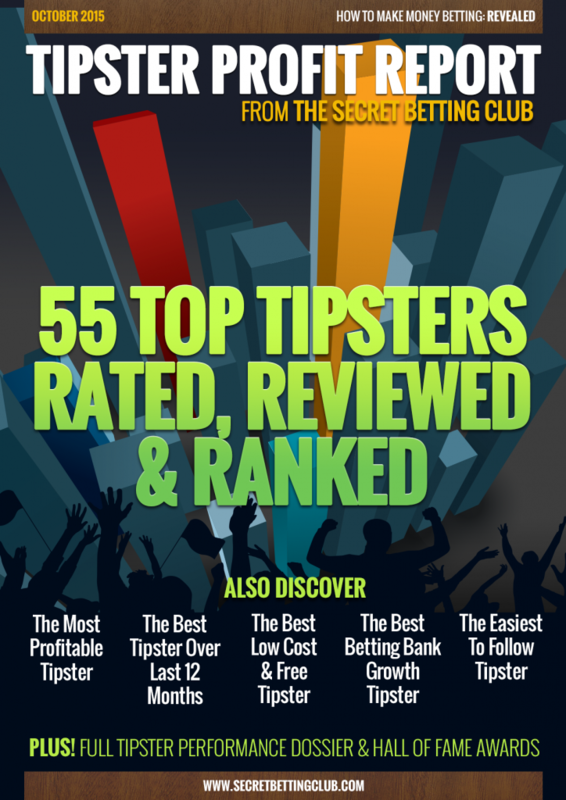 You will also have instant access to the whole SBC back catalogue containing the detailed analysis and breakdown of all the very best tipping services in the market. After all, as we’ve established, there are many ways of making money from betting. You just need to know what they are, and where to find them.